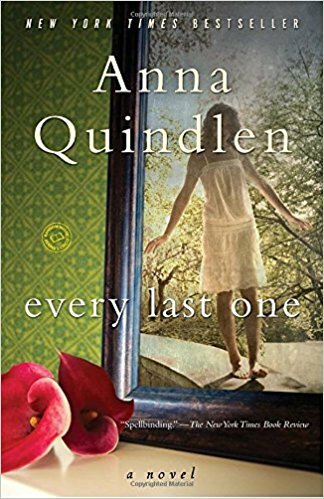 a book chick: "Every Last One"
my take: As I was readying my Kindle for a two week vacation (PACKING LIGHT BECAUSE BOOKS ARE BETTER), I spied this novel in an e-book email offering. Long ago reads from Ms. Quindlen were great ... could this cheap-o unknown be any good? For $1.99 could I go wrong? The characters and situation seem so plausible that when the unthinkable happened, it deeply affected me. I'd 100% bought into the life of the Latham family as told by Mary Beth, mother of three teenagers. The everyday minutia of managing a household, children with various issues, and a landscaping business made me think it could be my own life she was describing. So. Ordinary. I thought the story was about the kids' problems. Until the real story started. Startling. Wrenching. A ripped-from-the-headlines kind of story that left its mark on me. Unsettling because tragedy is visited upon people not like ourselves, right? my source: Anna Quindlen a Book Bub bargain? Yes, please.